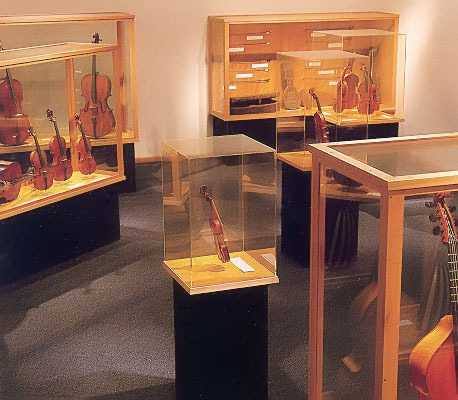 The Witten-Rawlins Collection, on exhibit in the Rawlins Gallery, includes many of the earliest, best preserved, and historically most important stringed musical instruments known to survive. Included in this remarkable collection is a trio of unaltered and virtually new instruments by Cerin (1792), Gragnani (1788), and Mantegazza (1793); two of only three classic Cremonese instruments which survive in their original, unaltered condition--the Andrea Guarneri tenor viola (1664) and the Brothers' Amati violino piccolo (1613); Andrea Amati's King 'cello (after 1538); one of two surviving instruments by Zanetto of Brescia (before 1564); a great viola by Zanetto's son, Peregrino (after 1564); a superb viola by Gasparo da Salo (before 1609); violins, violas, 'cellos, viols, lutes, guitars, and other instruments by the great 16th-, 17th-, and 18th-century masters, including three generations of the Amati family, Magnus Tieffenbrucker, Matteo Sellas, and others, plus more than 65 additional musical instruments and 25 bows. The collection also includes luthiers' tools, labels, and documentary source materials, including an assortment of important 16th-century books and prints. Laurence C. Witten (1926-1995) began collecting in 1942. A graduate of the Yale University School of Music, he married Cora Williams, a pianist who also attended the Yale School of Music. From 1951 to 1991, he operated Laurence Witten Rare Books in Southport, Connecticut, and became a well-known specialist in Medieval manuscripts, early printed books, and Renaissance manuscripts and books. At the same time, he also formed a large collection of early sound recordings, now the nucleus of the Sterling Library Historical Sound Recordings Collection at Yale. He also collected antique automobiles and pre-Columbian art. During the 1950s, Witten began to think seriously of establishing an "ideal" collection of stringed instruments. When several outstanding older collections of instruments, labels, tools, and documents--notably those of the Bisiach family in Milan and Emil Herrmann of Berlin/New York--were broken up during the 1960s, a number of those "ideal" instruments became available. The remarkable trio of unaltered and virtually new instruments by Cerin (1792), Gragnani (1788), and Mantegazza (1793) first came to light as a result of the Stradivari Bicentennial in 1937. The trio was united for the first time in Witten's collection. The Andrea Guarneri tenor viola (1664) in original condition was acquired from the Bisiachs, followed by the violino piccolo by the Brothers Amati (1613) in equally original state. Other important acquisitions were the The King 'cello from the Prieto collection, a Nicolo Amati violin (1628) from the Rodewald collection, already exhibited for more than a century, one of two surviving instruments by Zanetto of Brescia (before 1564), a great viola by his son Peregrino (after 1564), and a superb viola by Gasparo da Salo (before 1609). The liquidation of the contents of Hever Castle in England by Lord Astor in the 1960s revealed the existence of a group of primarily Venetian plucked instruments. These, along with an ivory lute from the music room of Astor's London house, Cliveden, and a 16th-century harp from the Bisiachs, were also added to the Witten holdings. Documentary materials in Witten's collection include important books and graphics dating back to the 16th century. Also included are the Herrmann and Bisiach collections of antique parts, fittings, tools, drawings, bridges, cases, and other items associated with the early history of violin-making, and the Salabue-Fiorini-DeWit-Herrmann collection of violinmakers' labels. Virtually complete for important Italian makers of the 17th-19th centuries, the collection of labels was begun no later than 1804 by Count Ignazio Alessandro Cozio de Salabue, the famous Italian collector and diarist, who bought Stradivari's workshop materials from the heirs and owned many great instruments. There are more than 250 Italian labels, including five by the Amati family, eleven by the Guarneri, twenty-three by the Guadagnini, and eight by the Stradivari. In addition, there is an immense holding of non-Italian labels, especially rich in German masters, formed by the late Emil Herrmann. The Witten Collection was acquired by the National Music Museum on February 5, 1984, through the generosity of Mr. and Mrs. R. E. Rawlins, honorary members of the Museum's Board of Trustees. Shortly after its acquisition, the Board of Trustees officially named it the Witten-Rawlins Collection in order to recognize the extraordinary generosity of Bob and Marge Rawlins that made it possible to keep the collection in the United States. Excerpted from André P. Larson, The Shrine to Music Museum: A Pictorial Souvenir (Vermillion: The National Music Museum, 1988) and André P. Larson, "In Memoriam: Laurence C. Witten," The Shrine to Music Museum Newsletter, 23, No. 1 (October 1995), p. 8. Additional information about the Witten-Rawlins Collection may be found in articles by Margaret Banks, Charles Beare, and André P. Larson listed in the Stringed Instrument Collection section of the Bibliography. Many instruments from the Witten-Rawlins Collection are on display in the Rawlins Gallery. Others are available for examination by appointment (see Access guidelines) in the Museum's study-storage areas.